As a masseur or masseuse, the comfort of your clients is sure to be of the utmost importance to you. In seeking to achieve this goal, many massage professionals have come to rely on massage table warmers. As one would expect, table warmers – which are sometimes referred to as a heating pad massage table – are designed to provide steady, soothing warmth to clients throughout their appointment. These specialist table warmers have become popular thanks to their ability to help clients make the most of their massage experience; after all, a cold, unforgiving table is far from welcoming. In contrast, a table that is pleasantly warm is inviting, comforting, and ensures your client will enjoy all the benefits therapeutic massage can provide. However, while the principle of a heating pad massage table is undeniably beneficial, choosing which table warmer is suitable for your clients is often a difficult task. Noticing this issue, we decided to review five of the best massage table warmers currently available, so you can decide which suits your specific needs. 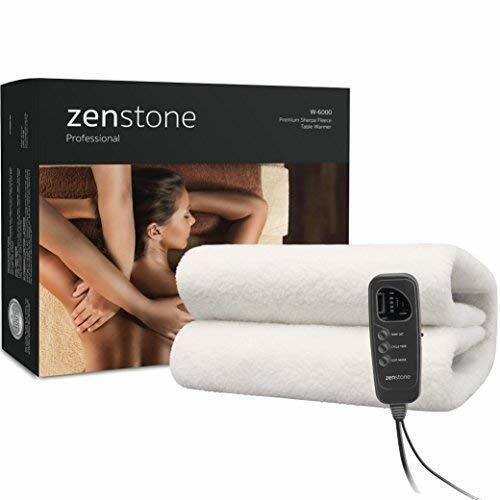 ZENSTONE’s massage table warmer has previously been voted Best in Class by professional therapists, and when put to use, it’s easy to see why this warmer has enjoyed such widespread acclaim. The warmer serves as a two-in-one heating pad and massage table cover, making it a sound multipurpose investment. As a table cover, the ZENSTONE is impressive, featuring a soft Sherpa fleece cover that is sure to be very well received by your clients. The warming abilities are, however, the foremost concern for any therapist buying a heating pad massage table, and ZENSTONE’s offering certainly has plenty to offer in this regard also. There are five heat sensitivities included, so you can be sure of finding the perfect match for your clients, with the warming capabilities activated by body weight – a nice touch that ensures energy efficient usage is preserved at all times. For added safety, the warmer also automatically shuts off if it detects there is a risk of overheating, and four different timer programs add an extra, much-appreciated element of control. In truth, it is no surprise that this table warmer is so effective; research from the International Journal of Therapeutic Massage & Body, among others, was considered when designing the product. This background, coupled with fantastic usability, definitely make the ZENSTONE Pro massage table warmer and cover a worthwhile consideration for any professional massage therapist. 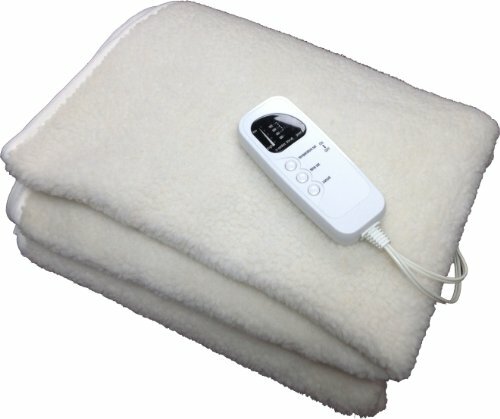 As one would expect from a reputable brand such as Therapist’s Choice, this Deluxe fleece warmer has plenty to offer both clients and therapists alike. First and foremost, the design has clearly been carefully considered in order to provide the best possible experience to users – simple, but effective, reigns supreme. The full-size warmer is equipped with sturdy elastic corner straps, which fit neatly over most standard massage tables, helping to ensure the comfortable, client-friendly fleece top remains firmly in place throughout its time in use. Alongside the impressive, high-quality design, there is an array of safety features that help to further enhance the Therapist’s Choice warmer. Over-heat protection is a necessary inclusion in a warmer capable of heating to around 88°F, and four timer settings help you to exert complete control over the duration of usage. Perhaps most notably of all, however, is the inclusion of a one-year limited warranty; this helps to secure your investment and, in the unlikely event you do experience any issues, ensures problems can be rectified quickly and efficiently. By combining this after-sales protection with a smart design and fantastic usability, we can easily conclude that this Therapist’s Choice warmer may well be the right, well, choice for you. 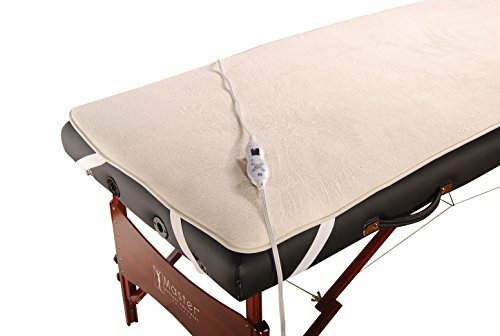 The fact that the EARTHLITE massage table warmer offers two-in-one functionality – it acts both a table warmer and a cover – is laudable, but cannot be said to be unique. However, the quality of the fleece cover does offer something different; the fleece is incredibly soft to the touch, and at around 1”, is one of the deepest fleeces currently available on the market. 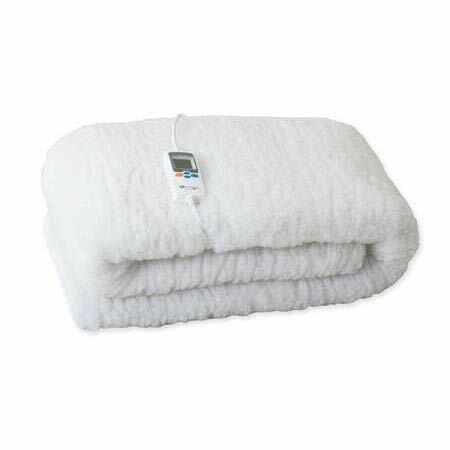 While the depth of the fleece ensures that this warmer will be well appreciated by clients, it’s important to note that the EARTHLITE warmer has not neglected ease of use for therapists. The digital timer – which allows up to 12 hours of programming to be set – controller allows the therapist to take complete control of the massage environment. The structural design is also impressive; corner straps help to keep the fleece in place, and most users will find that the fleece folds well enough for easy transportation when attending out calls. A final structural design flourish is found in the length of the electrical cord; if you have previously struggled to with cord length restrictions when using massage table warmers, such concerns can become a thing of the past thanks to the EARTHLITE’s 13-foot cord. Safety remains a paramount concern with massage table warmers, and EARTHLITE have once again delivered: automatic overheat protection is included, so you can always be sure that your client will be perfectly safe while the warmer is in use. If you have been hoping to find a warmer that offers significant luxury to your clients and simple, straightforward user experience for you, then there’s no doubt that the EARTHLITE massage table warmer is a fantastic all-rounder that should suit your needs very well indeed. 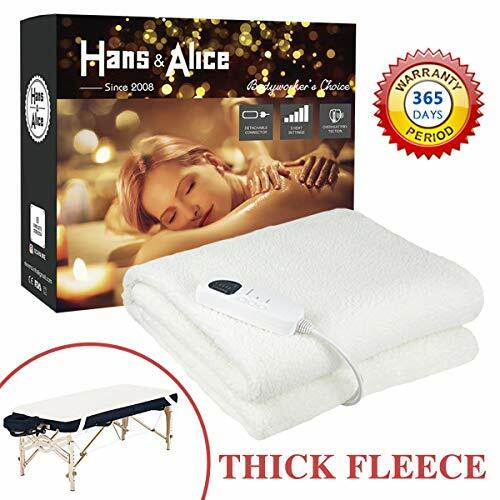 TWO-IN-ONE MASSAGE TABLE WARMER & FLEECE PAD: Your clients will stay cozy and warm on this premium 1" thick fleeced heating pad in the coldest of environments. Compare to other products with 0.5" fleece! DIGITALLY CONTROLLED TEMPERATURE: Choose the perfect temperature for your clients with the digital controller. Easy to use. DIGITAL TIMER & auto overheat protection provides ultimate safety and convenience. Set the timer in half hour increments - up to 12 hours of programming. GENEROUSLY SIZED: Fits all full sized massage tables (30"x73"). Elastic corner straps hold the warmer securely in place. 13 ft. power cord conveniently reaches wall power outlets. ONE YEAR WARRANTY: No questions asked! We ship you a new one. Backed by Earthlite, the world's leading professional massage brand, since 1987. The Master Massage UL massage table warmer is an impressive option, with particular benefits for therapists who are hoping to find a warmer that provides a user experience that can be fully customized. For example, the heat settings; a total of 10 are available, and the temperature can be controlled via a detachable controller – a small touch, but one that helps to underscore the commitment to ensuring therapists can work to their specific preferences. The safety standards are also impressive; the Master Massage warmer is ETL and CETL certified, and the four-hour safety shut off provides valuable peace of mind. The safety commitment continues with the decision to use electromagnetic radiation safe cables. The reason for the exclusive cable design is linked to studies which had suggested that heating pads may be detrimental, and are a step taken to limit the amount of radiation a client is exposed to during treatment. It’s a rare, but incredibly impressive, feature that is sure to be welcomed by clients. Despite its range of functions, this warmer should also be easy to live with; it can be machine washed for maximum convenience, and the large adjustable straps ensure that the warmer will remain firmly attached to the table at all times. There’s also no need to worry about long delays waiting for the warmer to heat, as temperatures of up to 140°F can be achieved in around seven minutes. With a strong performance thus far, the final question is the experience for the client – and thankfully, the Master Massage warmer continues to perform well. The fleece is well-made and incredibly comfortable, so you can be sure of positive client reviews to accompany your own pleasant user experience. Large elastic straps allow the warmer to fit most massage tables. Due to their very nature, security is always a foremost concern when purchasing a massage table warmer – and in this regard, the H&A Deluxe massage table warmer performs exceptionally well. The warmer benefits from both UL and ETL certification, the automatic overheat protections works well, and an eight-hour auto-off function completes a very reassuring picture. However, while safety has clearly been a primary concern for H&A when developing this warmer, this focus has not come at the expense of all-round experience – the warmer continues a strong performance across other areas of consideration. There are five heat settings to choose from, and the maximum temperature is around 135°F – so every customer’s individual preferences can easily be met. The warmer has also been very thoughtfully designed, with particular attention paid to the cover. Although the cover is a fairly standard fleece, the particular fleece chosen by H&A is plush enough to ensure that the heating coils beneath the surface are completely undetectable, so your clients can be sure their comfort levels will be well maintained. Finally, it’s interesting to note that the H&A Deluxe can also be used as a warming blanket on a bed – which is rather unusual amongst massage table warmers. While not a particular concern in terms of professional usage, the fact that the warmer also offers domestic functionality could potentially provide a little extra value for money. In fact, value seems to have been of particular concern to H&A, given that a 360 days limited warranty is also included. Overall, the H&A Deluxe is a great buy, especially given the dual-usage benefits, safety credentials, and client-focused design. Your clients will stay cozy and warm on this professional, luxurious fleeced warming pad in the coldest of environments. 360 days limited warranty with UL& ETL certification, Contact seller if you need tech support or return issues. Hopefully, one of the massage table warmers discussed above will prove to be the ideal choice for you and your clients. All of them are solid units, and work well for a long time to come.